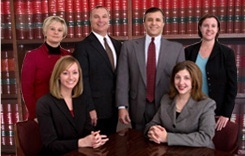 Rahaim & Saints, LLP, was founded by attorneys Andrew Rahaim and Sheldon Saints in 1993. Their practice focuses on helping the innocent injured recover for personal injuries, auto accidents, slip and fall, dog bite and worker's comp injuries. Rahaim & Saints, LLP was founded in 1993 by local attorneys Andrew Rahaim, Esq. and Sheldon Saints, Esq. Their focus continues to be helping those injured in car, truck, motorcycle and pedestrian accidents, slip and falls, dog bites or work incidents recover lost wages, medical bills and the compensation needed to help with pain and suffering and permanent injuries. These attorneys and their paralegal and staff have helped thousands of innocent injured people deal with all the complexities and worries an injury can cause. There is no consolation fee, no retainer, and no fee until we recover for you. Rahaim & Saints, LLP can also help if you or someone you know has been charged with a criminal offense or DUI. Andrew Rahaim has handled criminal defense matters since 1980. If you questions or worries about a Divorce or Family law case, partners Megan Walstrom, Esq. and Rachelle Cutrona, Esq. handle all matters relating to these areas including PFAs, custody , child support, alimony and property division. Although there is a reasonable consultation fee, many or your questions can be answered at the initial meeting which will point you in the right direction and help you decide if you need an attorney to help you throughout this potentially emotional and confusing process. Rahaim & Saints, LLP, can help you with questions bout debt and Bankruptcy options. We are a debt relief agency. Partner, Tiffany Poole, Esq. has focused on individual Bankruptcy claims for 15 years and can guide you through your options to obtain debt relief from mounting medical bills, crushing credit card debt or other creditors pressures. If you file a Bankruptcy, creditors can no longer call or harass you. Initial consultations are free. Call us today for a prompt, convenient and confidential consultation at one of our two locations: Kirkwood Highway between Newark and Wilmington, and in Peoples Plaza near Glasgow and Bear Delaware. The lawyers at Rahaim & Saints have handled auto accident, personal injury and workers' compensation matters for 36 years. We help the injured and their families pay medical bills, replace lost wages and be compensated for all types of injuries. Founded in 1993, Rahaim & Saints, LLP, is a law firm of five attorneys dedicated to helping people with legal needs and questions regarding Delaware laws. Andrew Rahaim and Sheldon Saints, the founding partners, are life long Delawareans and have practiced law in Delaware since 1980 and 1982 respectively. They both practice primarily in the area of personal injuries, automobile/truck/motorcycle accidents, slip and falls, and dog bite claims, as well as workers' compensation. These attorneys, their paralegals and staff have helped thousands of innocent injured Delawareans recover for medical bills, wages, pain and suffering and permanent injury for over 35 years. In these areas of representation there is no consultation, retainer or hourly fee. Our firm is paid only when you recover. In addition to the areas of injury law and recovery, attorneys at Rahaim and Saints, LLP, handle criminal defense and DUI defense cases and have been doing so since 1980. Consultations are free. The law firm of Rahaim & Saints also has two attorneys, Megan Walstrom and Rachelle Cutrona, who primarily handle Divorce and Family law matters such as PFAs, child support and custody issues. While there is a reasonable consultation fee, the initial consultation will provide you with the information you need to decide on your best course of action and whether you need to retain counsel to help you successfully deal with the emotional and often complicated issues in Family law cases, especially when children are involved. Rahaim & Saints, LLP, can also help you if you have questions regarding Debt and Bankruptcy. Partner, Tiffany Poole, has practiced primarily in the area of Bankruptcy law for 15 years, and has helped many Delawareans resolve debt problems incurred due to unemployment, credit card debt, medical bills and other unforeseen factors. Our firm focuses on service. Our attorneys, paralegals and staff strive to answer and return all calls and emails promptly so that our clients are kept up to date on progress, and have no unanswered questions. We also send copies of letters mailed in the case directly to the client so that they are kept abreast of all issues and answers. We are here to serve our clients, and we never forget that. Sheldon Saints handles claims in all matters dealing with automobile accidents, truck accidents, motorcycle accidents, slip and falls, dog bites, and other personal injuries, including all types of workers' compensaiton claims. Ms. Poole handles all types of Chapter 7 and Chapter 13 bankruptcy matters.